I am not an artist. Let that be know right from the get go.. 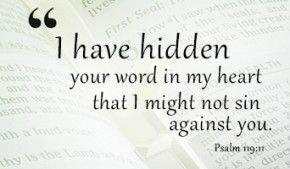 I am however a lover of the Lord's Word! I found this group on Facebook Hide his Word in my heART which is a private group all about reading the Word and bringing some art form from it. I love that the founder Maymay puts up a youtube video each Sunday and I can get on Monday morning and watch the video for the week. She guides you through a suggested art work, which for me is perfect as I am just starting out. I am looking forward to this group to learn to do some more art work to incorporate into Bible journaling. Also you are reading the same scripture verse for the entire week, which really helps you to memorize it and see how God can speak to you through it. I am excited to share my journal with you as I go, for accountability sake more than anything. Also sometimes it is nice to see someone without artistic ability in drawing, so that it seems attainable! Some of the great artists overwhelm me with beauty that I just can't even begin to draw. But that isn't what it is about.. it is about time with the LORD. This week's video can be found HERE. It is just a 14 minute video. I plan to get my cover made today and can share that with you, and as I work through my journal I may post some pictures or just some things the Lord is speaking to me. Excited to share more of my heart with you all, and have a log of my growth for myself.